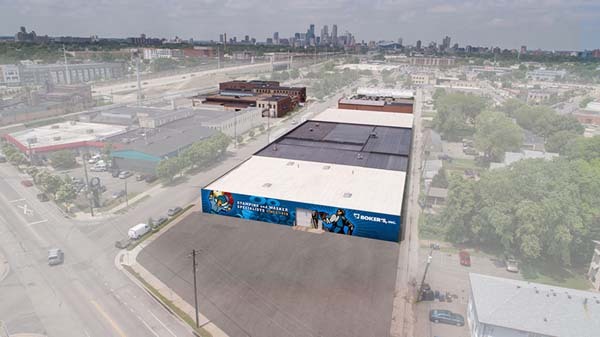 Boker’s Inc. completed an expansion of its Minneapolis facility in December, bringing its total manufacturing and headquarters space to roughly 165,000 square feet. 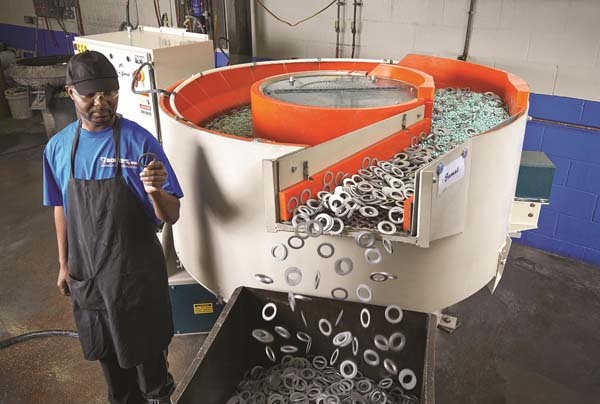 Photo courtesy of Boker’s, Inc.
As its product mix continues to diversify, Boker’s, celebrating its 100th anniversary, is adapting to changing customer needs by adding capacity and streamlining its workflow. Herman Garmers, a practicing dentist, was stumped in the early 1930’s while searching for someone to manufacture the medical device he invented. Luckily, he ran into John Peter Boker. The two men crashed into each other while driving. Despite the fender bender, they talked. Garmers wanted a manufacturer who could make the complex stampings needed to secure the connecting parts of his new dental instrument. Boker, whose father founded the stamping firm V.A. Boker & Sons in 1919, wanted customers. Garmers had come up with an idea to improve the clamping structure for dental cotton roll holders, which securely hold cotton in place during dental procedures. Anyone who has visited a dentist knows that cotton holders help dentists during procedures by making their working area more visible and accessible. They’re used in treatments like bleaching, fillings, and operative and restorative treatments. When the fender bender happened, Garmers was having trouble finding a supplier who could manufacture large quantities of the stamped parts he needed to complete his dental instrument. But the accidental meeting with Boker gave him the opportunity to get to know the manufacturing partner he needed. In the more than 80 years since then, Garmers Dental Instruments Inc., has grown an inventory of dental tools well beyond its initial cotton roll holder. Boker’s, which is celebrating its 100th anniversary, has built a century-long reputation for stamping high-quality, tight tolerance custom stamped metal parts, including complex stampings, washers, spacers, and shims. Boker’s Marketing Manager Tony Kersey described Boker’s as a contract manufacturer of precision stampings and washers, with roots in the short-run stamping industry. One of the company’s key strengths is its in-house toolroom. One example showed the advantages of using a progressive die. When a customer asked Boker’s to make a part that is blanked, pierced, formed, and extruded, Boker’s did what the customer wanted, but its employees, with their continuous improvement philosophy, kept evaluating the process and figured out how to make it faster and more efficiently. They moved it onto a progressive tool that created the parts more efficiently in one tool, rather than producing it with numerous compound dies. The part, made in 10-gauge HRPO (hot-rolled, pickled and oiled) steel, was used in the transit industry and had a 3.625-inch outer diameter, with tolerances to plus or minus 0.005-inch. The part included a series of challenging small, narrow webbed holes. Boker’s produces about 25,000 of these parts per year, Tony Kersey said. Various complex stamped metallic components produced by Boker’s. Photo courtesy of Boker’s, Inc. Although Boker’s still specializes in manufacturing high-quality metal stampings for dental and medical applications, its global organization sells parts to numerous industries, including aerospace, automotive, medical, and consumer product OEMs, in more than 70 countries. At its founding, Boker’s worked mainly with agricultural firms, but when the wars came, the firm supplied the defense, military, aerospace, and aircraft industries. The materials were mainly steel, aluminum, copper, and copper alloys. The quality goal in the early days was to achieve form, fit, and function. Did the part look right? Was it shaped properly? Did the part fit with components around it? Did it function? Did it accomplish its required task? If so, it was acceptable. But customer requirements have become much stricter since the early days. Today, Boker’s generally hits tolerances of plus or minus 0.005-inch, “although we can hold tighter tolerances in some circumstances,” said Tony Kersey. The company’s precision manufacturing capabilities span a range of sizes up to 12 inches by 12 inches, thicknesses from 0.005-inch up to 0.190-inch (varying by material), and draws up to 3 inches deep and 8 inches in diameter, the company said in a press release. Knowing that “world-class manufacturing” is an ongoing process, Boker’s prides itself on using many of the latest technologies and precision metal stamping manufacturing concepts. Boker’s completed an expansion of its Minneapolis, Minnesota facility in December, bringing its total manufacturing and headquarters space to roughly 165,000 square feet. The additional space nearly doubles the company’s manufacturing floor. Boker’s will invest in new manufacturing equipment as needed to meet customer demands. In the meantime, workers will gain some elbow room and efficiency by spreading out their existing machines into the expanded plant. Boker’s diverse customer base gives the company a presence in industries that span the globe. As these industries and customers evolve, Boker’s continues to adapt to meet their needs. Tony Kersey said the company will be able to streamline its workflow process and add more capacity with the new space as product diversification continues to grow. “We are counting on serving companies on the forefront of technologies, as well as continuing to work with our customers who are re-inventing themselves and their products to fit current market needs, today and into the future,” Kersey said. Besides being a certified Women’s Business Enterprise, Boker’s is certified to the AS9100D (2016) and ISO 9001:2015 quality management system standards. The company is also ITAR and RoHS compliant. “Our quality assurance facility allows Boker’s to increase productivity and minimize lead times while simultaneously meeting increased industry and internal demands for producing and maintaining quality documents and specifications,” Boker’s said on its website. Its quality assurance facility is approximately 900 square feet in size. One niche that Boker’s specializes in is application-specific washers. With what appears to be almost limitless varieties of washers available, it is important to select the most optimal type of washer for a specific application. Failure to specify the correct washer can result in machine downtime and associated lost production costs. An experienced operator performs a visual quality check to ensure products meet customer requirements. Photo courtesy of Boker’s, Inc.
Washers are manufactured in a broad range of metallic and non-metallic materials. 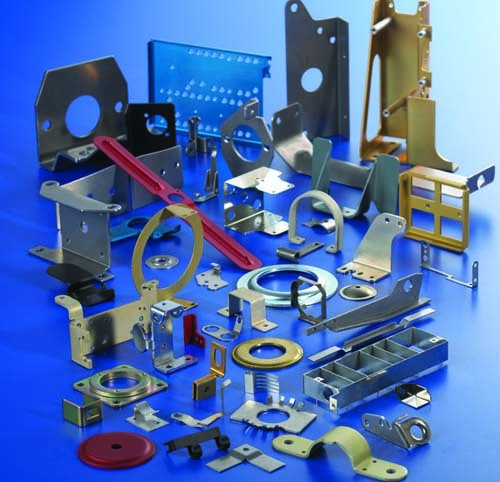 Metallic materials include low-carbon steel sheet, various spring steels, stainless steel, aluminum, brass, copper, and nickel silver. Non-metallic materials include ABS, acetal, polyester, nylon, MD nylon, polycarbonate, fiber, polyethylene, and various NEMA grade phenolics. Washer material is important because some applications require a specific material to ensure the washer withstands environmental conditions. In addition to determining washer material and style, it is important to consider additional factors before specifying a type of washer, including tolerances, material and thickness, temper, hardness and heat treating, compatibility, flatness, burrs, and finish. Chuck Kersey provided an example. “D-washers, also referred to as clipped washers, are generally used in applications where space limitations do not allow the use of a flat round washer, as well as when keeping an assembly stationary is required,” he said. Boker’s maintains more than 32,000 stock tools for flat round washers, spacers, and shims without tool charges. Customers can choose from a wide variety of sizes, thicknesses, and materials, including non-metallic, to suit an application. The outside diameters range from 0.08-inch to 5.14-inch, with a wide range of inside diameters. The tools can be used to “manufacture non-standard flat washers, spacers, and shims from over 2,000 commonly used and hard-to-find materials,” Mark Kersey said. The 2,000 materials are kept on hand to help customers with Just- in-Time delivery requirements. Boker’s also serves the recreational transportation industry, creating made-to-order stampings and washers for automobiles, all-terrain vehicles, jet skis, snow mobiles, motor homes, dirt bikes, quads, and side-by-sides. Boker’s has a cleaning and deburring department that offers an agitated chemical washing system, rotary deburring machines, vibratory deburring machines, centrifugal tumblers, and heated centrifugal dryers. Also available for use are a Lewis ultrasonic cleaner, high-energy deburring machines, mass finishing machines, and a custom parts dryer. Boker’s (www.bokers.com) products are used for various applications within recreational vehicles, including transmissions, drive trains, seat assemblies, floats, enclosures, brackets, and vibration dampening and suspension systems, among many others. Customers frequently ask for machined parts during the RFQ process. Boker’s is often able to stamp parts that were designed to be machined, not only to save the customer money, but also to meet the customer’s requirement for the machined part. “Stamped parts are inherently more cost-effective for our customers, provided that the inherent characteristics of the stamping process are recognized and acceptable in our customer’s applications,” Tony Kersey said.